These are some of the most glorious temples in South India. This one’s probably the most famous temple in South India. If you needed just one reason to visit Madurai, let it be this temple. Meenakshi Temple is huge and grand; and a walk around its parameters is truly enriching. Dedicated to Goddess Parvati, the temple also houses images of many other Hindu deities. This one is the second out of the two temples dedicated to Goddess Saraswati in India. The other being in the northern most state of Jammu & Kashmir. The highlight of Gnana Saraswati Temple is the special pooja (prayers) that happens every morning where children are taken for blessings before they begin school. Namdroling Monastery is the largest teaching centre of the Nyingma lineage of Tibetan Buddhism in the world. The monastery is home to nearly 5,000 monks and nuns, and is often visited Tibet’s spiritual leader, the Dalai Lama. Reaching a height of 63 metres, the Brihadishwara Temple is the tallest temple building in India and is dedicated to Hindu god, Shiva. It’s not only a prime example of Tamil architecture, but also a treasure trove of religion, art and history. An all-white temple famous for being hand-carved from stone , Thanumalayan Temple is dedicated to the three Hindu gods; Lord Shiva, Lord Vishnu and Lord Brahma, in a single form called Sthanumalayan. The temple also houses one of the tallest statues of Lord Hanuman in India. 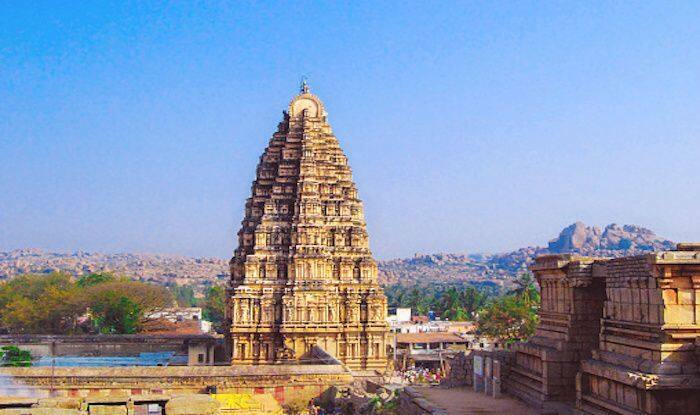 Virupaksha Temple in Hampi is arguably the oldest functioning temple in the whole of India. It’s a temple dedicated to Hindu god, Lord Shiva, and is an important pilgrimage site containing a shiva lingam (a sacred stone), that is said to change colour three times a day.